I often wonder how the no-knead dough principle will work on whole wheat flour. I haven't used it in any of my bread making activities. I do use it for pancakes and waffles but not for baking. Well I can't be wondering forever so I grabbed my bag of whole wheat flour and made a batch of dough. I used grade B maple syrup instead of honey just to find out the difference. I can't stop singing praises about this recipe and who wouldn't? It is the easiest, no-fuss dough recipe that yields the softest, tastiest bread and all you have to do is stir and stir and just let it sit in the fridge for all the flavors to develop- the longer it stays chillin, the deeper the flavors will be. In a large bowl, mix together the eggs, water, maple syrup, melted butter, yeast and salt. Stir well with a wooden spoon. Add in the flour. Stir until you don’t see any more dry bits of flour (about a minute). Cover (not airtight) and stick it in the refrigerator overnight, or up to 4 days. The longer you keep it in the fridge, the better tasting the dough will be. The first thing I made is a loaf of bread which I topped with some toasted sesame seeds. I took out a grapefruit sized chunk of the dough and with floured hands just shaped it into a small loaf. Place in a greased loaf pan; brush the top with milk and sprinkle sesame seeds. Cover loosely with plastic and allow to rise until double in size, about an hour then bake at 350 degrees F for 35 minutes. It is crusty on the outside and tender on the inside. The dough test is not over yet. 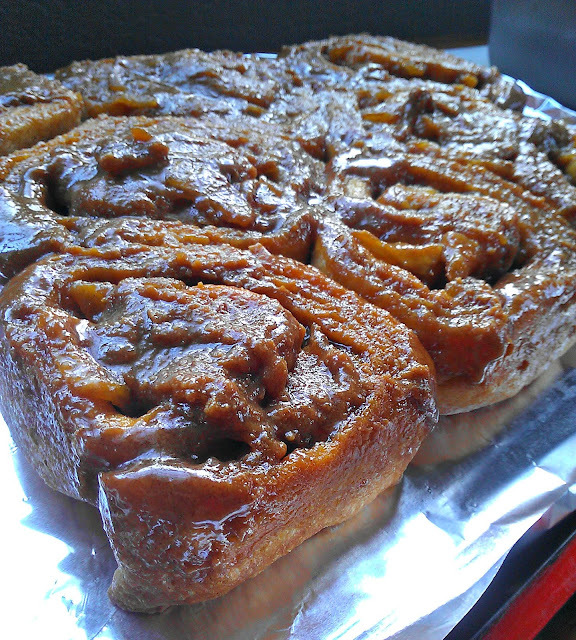 I decided make sticky buns. Caramel apples seem to be haunting me for quite sometime but I wanted cinnamon rolls though. However, cooking the apples in caramel sauce made me change my mind. Why not use the sauce as the goo since I have to drain the cooked apples before using as filling. Add half and half or heavy cream and stir. Arrange in the pan with the goo, making sure to leave an inch or so space from each other. I realized I had to take out one little piece so it ended with eight. I wish I had taken better pictures but it was kind of toxic in the kitchen. I will make this again for sure. Texture-wise, I can't complain because the bread is soft like I want it to be and of course, whole wheat is definitely healthy.